Vacation rental house. Sleeps 7, 3 bedrooms, 2 bathrooms. No pets allowed. Beautiful single story, three bedroom, oceanfront home, with a split level deck and a private patio located down by the water. 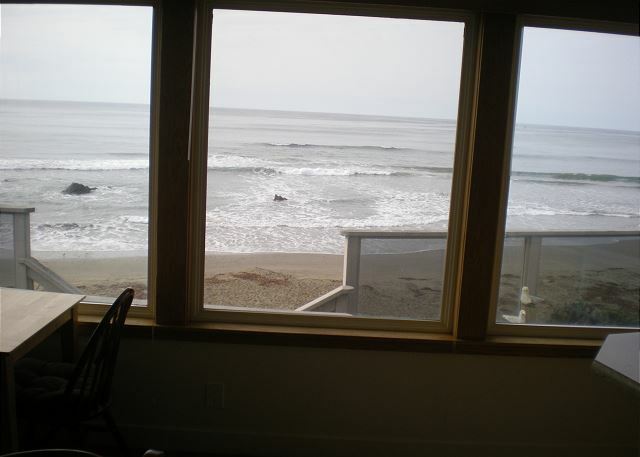 The open living room with its wood burning stove, dinning are, and kitchen all have spectacular ocean views. The bedrooms are located towards the back of the house. 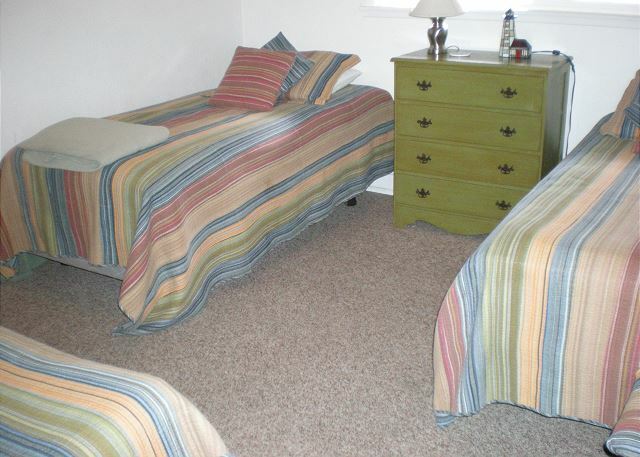 The room with the two twins can be used as either a king bed or as two separate twins. No smoking, no pets, linens & towels not provided. NIGHTLY MINIMUMS VARY SUMMER AND HOLIDAYS. Nice big house with 3 bedrooms and comfortable living room furniture! First time in this house and it was really nice. 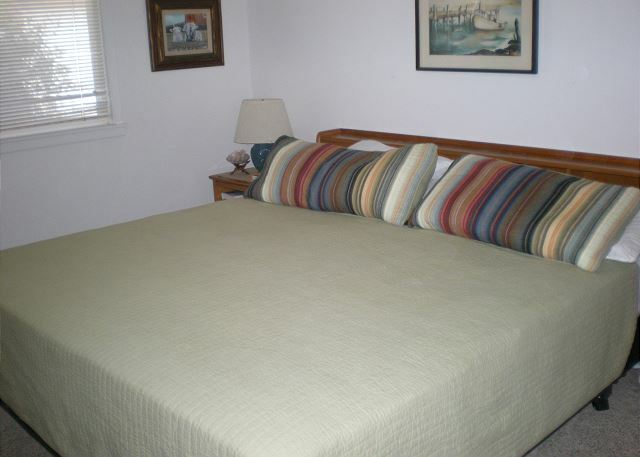 Lots of beds, a great ocean view and quiet, peaceful location. The beach front experience was fantastic. We enjoyed every minute of our stay. So much so that I have booked a week next October 2019. The house is great & prop. mgmt. people are great. Would recommend Coastal Escapes to all. Thank you. Clean, beautiful home with stunning views. Well appointed with walking access to miles of beach, pier and tourist shopping. From the deck we saw whales, dolphins, otters and thousands of sea birds. An amazing vacation I doubt we will ever forget. Great house. Steps to the beach. Well kept up house and furnishings. Home away from HOT Bakersfield! Beautiful on the beach home! Perfect on the beach location; everything that we dreamed it would be. We always now will want to vacation right on the beach. The home was clean and had all the cookware and utensils we needed. Everything was excellent! We've stayed here on many occasions. Enjoyed it each time. A week spent in heaven. Over the top with the rental home, the staff at Coastal Escapes. Especially Theresa. We would not book with anyone else when staying longer than a couple of days. Superb. It was a wonderful vacation! We met Jerry the seagull everyday. The back porches were a perfect path down to the beach. The kitchen had everything we needed! The beds were very comfortable as well. Our first stay at this fantastic rental. The view, location, beach access, could not have been better. Top of the line in every aspect for us. Would recommend to anyone, for a stay of a lifetime. 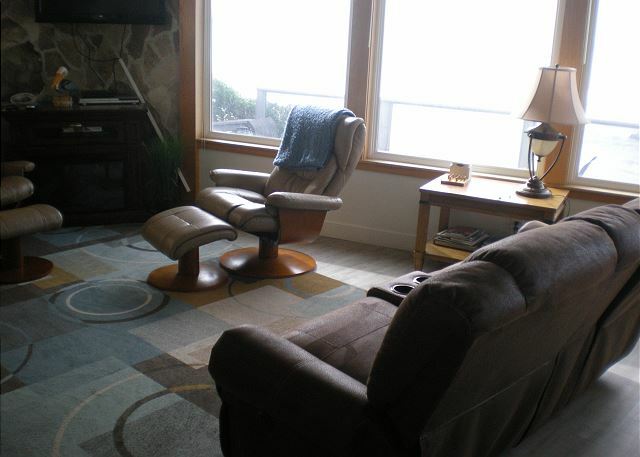 Great house accommodations for family, beautiful beach access & view. We've rented the house twice, and definitely will be back! 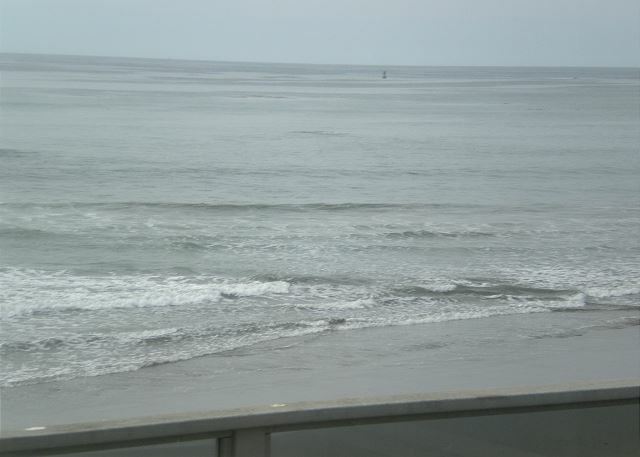 for the second year we had a great stay in your vacation rental at 1084 Pacific. We do have 2 suggestions. The TV wiring is hanging down and the tubing that at one time was attached to the wall is sagging. And the bedspread in the master has a hole in it. A new spread would be a great improvement. This house is great for total relaxation! Steps from the beach. Great viewing from the windows. Such a wonderful experience. We were helped by Teresa and Rhonda who were both very kind and helpful ladies. They helped us book a property on very short notice without any hassle. The property itself was breathtaking. Very spacious, comfortable, and has amazing views. Very clean and fully equipped with anything you need. The kitchen was very clean and so was the entire house. Highly recommend the company's services and this specific property to everyone. Once again, I was NOT disappointed!This was a really great place!We had a smaller group this time around and this rental was perfect from the view of the ocean to a perfect location to a cozy home! We had an absolute wonderful time! A very enjoyable week at a beach house. We had 3 children and they loved being able to walk right down the steps to the beach. The house was very nice and comfortable inside. It was well-maintained. We enjoyed walking into a house that was ready for our stay. The boys enjoyed going to the dirt track with their bikes. An added bonus for them. Looking forward to next summer! The activities change--The attraction doesn't. A great place to rest and recharge. We took our family vacation here this year, and could not have been happier with the house, the location, the amenities, and the condition of the home! 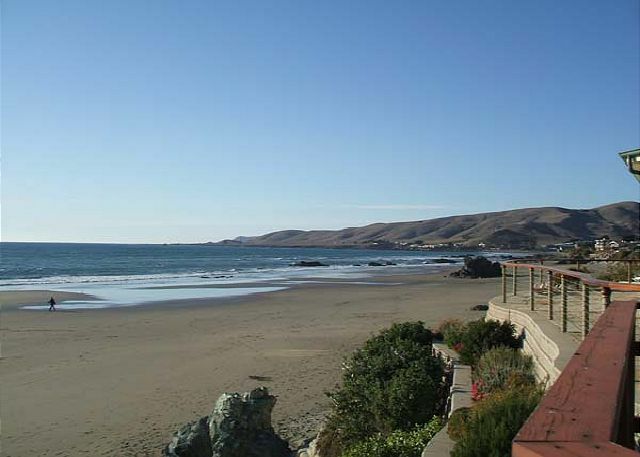 The home itself is beautiful and well-appointed, and has the best stocked kitchen I have ever seen in a Cayucos rental! 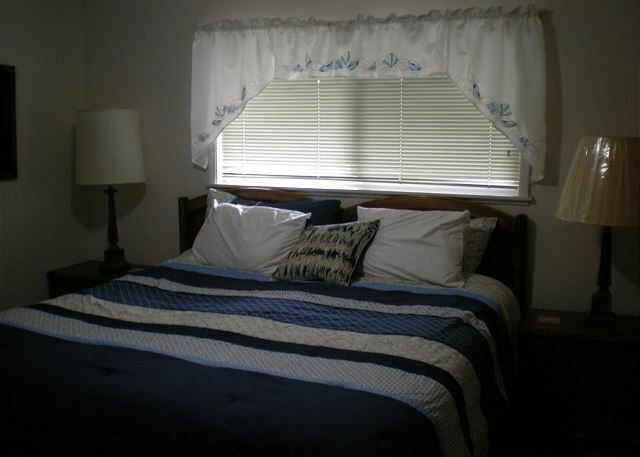 It was comfortable and extremely clean, and the recent remodel was fantastic. We loved feeding Jerry each day (you'll have to stay there and read the guest book! ), as well as taking long beach walks, having beach fires, and hanging out with the family. A perfectly wonderful experience from start to finish! Thank you for sharing your beautiful home! This house is awesome! Remodeled and it flows so much better. The only compliant I have is the beds are uncomfortable and most of the blinds don't work. But overall great house with great views and the stairs to the beach are the best of anywhere we have stayed. Oh and it is very clean and well stocked in the kitchen! We loved the "new" living area of the house. VERY comfortable with a BEAUTIFUL kitchen! We were blessed to be staying there when a torrential rain fell and the surf covered all of the sand. It was GORGEOUS! We recently had friends coming to visit from Canada and Washington, and decided it would be fun to give them the ultimate central California beach stay experience. The house we picked was perfect in every way and made for a fabulous weekend for all of us. The view was outstanding and we loved being steps from the beach and also close to downtown. The kitchen has recently been remodeled and is well stocked with cooking and eating utensils. Would stay there again in a heartbeat! Great time, clean comfortable home. Virgs fish trip was awesome. However, steps down beach need replacing, not just one or two, but all of them. One of my crew had a step collapse as he walked down to beach. but, GREAT TRIP< recommend to anyone !! Great house, great location, great people. We love vacationing on the beach, and this home provided all the amenities that we love. 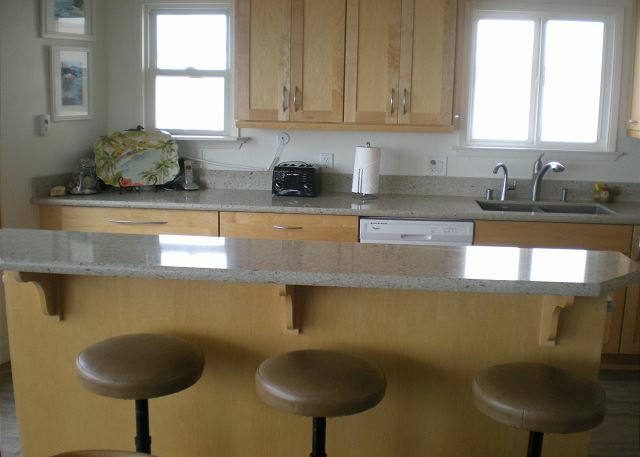 Kitchen has plenty of counter space & storage, along with an island and bar stools. 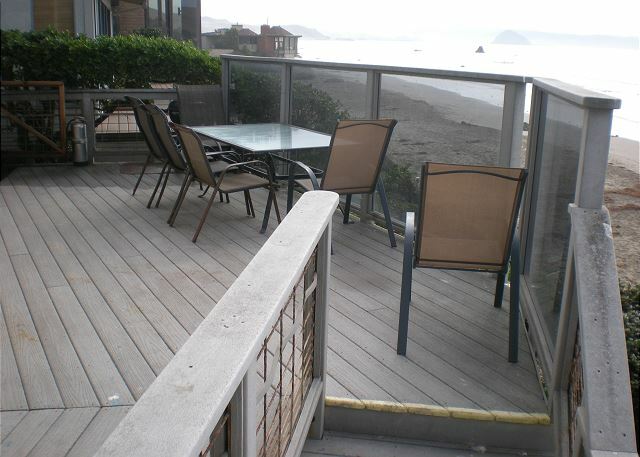 We love the two decks, and ocean view. Hose outside the laundry room for rinsing sand off little feet. Storage shed with extra sand toys and boogie boards. Beds comfortable. We would definitely recommend this house to others. We have stayed at this house many times. The location is absolutely perfect. The remodeled kitchen and new floors are awesome. Cayucos is such a hidden gem and we have been visiting for 12 years now. Coastal Escapes staff are genuinely kind and happy people and they make sure your stay with them is wonderful. We will continue to rent through them until we can move to Cayucos someday!!!!! Thank you thank you thank you! "Marjie from Miramonte posts great review"
This writer loves "her home away from home"!! We've been renting this wonderful place for about 7 years now. We live in the mountains, so this is perfect to be right on the beach! It's about 30 steps to the sand. In the perfectly thought-out newly remodeled kitchen and living room, you can see south to Morro Bay, and north to the end of the bay. It's so cool to wake up and walk down the hallway looking at the blue waves and seeing all kinds of sea life. This last week we were privileged to enjoy otters and dolphins with the naked eye, but bring your binoculars anyway! We enjoy using the bbq for fresh surf and turf as they say. 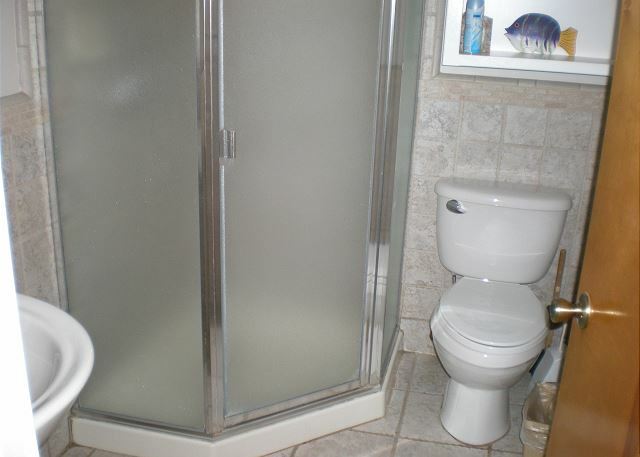 The two baths are adequate. The "king bed" in master is being requested again for a new one. We always dislike our last day, because we don't want to leave! Most memorable Birthday for my mother and myself!! This was our first time at Cayucos.. And I must say we had the BEST Time there! It was my mother's 77th Birthday and she loved it. Rhonda and Theresa were awesome...made my trip stressed free!! The house was perfect! No complaints!! !We will be rent there again or in the same area!! Just love this house, feels like home. Views are unbelievable. Love working with Rhonda & Theresa at Coastal Escapes. Been using Coastal Escapes for probably over 10 years. Discovered 2 new restaurants. The Pie Man & Deli on Cayucos and Lolo's in Morro Bay. Looking forward to coming back to Cayucos in September. I UNDERSTAND THAT THIS WAS REMODELED LAST YEAR. THE PROBLEM WITH THE REMODEL IS THAT THERE IS CARPET UNDER THE DINNING TABLE. OTHER THAN THAT WE HAD A WONDERFUL STAY. We all had an amazing time. We watched dolphins from the living room windows!!!! Can't wait to come back. Very nice home! Comfortable and clean! Beautiful views! Just love this house. Stairs to the beach, great views. Kithen well stock with utensils, pots, pans, ect, Beds are comfortable. Short walk to town. Can't wait till we come back next year, twice !! Rhonda & Teresa are a plesure to deal with, they are both so friendly and helpful. We had the most wonderful time in Cayucos. The house was wonderful in every way. We had the wedding and all the family were close by so we could walk to each other's houses. This house is gorgeous, the beds were great and we really hope to come back soon and rent it again!! Thank you for all your help! 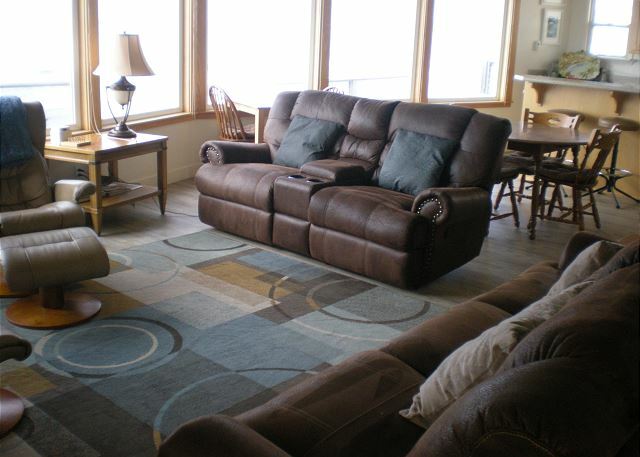 Great house, super location, new furniture--generally a fantastic vacation experience. Plus--humpback whales! Best Vacation ever !! Celebrated wifes 50th birtday ! Great house, great views. Rhonda and Teresa at Coastal escapes are wonderful. We have been renting this house for twice a year, several years now. We Love It !! Great location.... Easy walk into town. Love being able to sit inside and let our kiddos run down to the water. Nice size great room & bedrooms. Will look into staying here again! We rent a house each summer for one week in Cayucos. Having rented numerous homes over the years, 1084 Pacific is by far the best. This home is always found to be clean and in excellent condition. 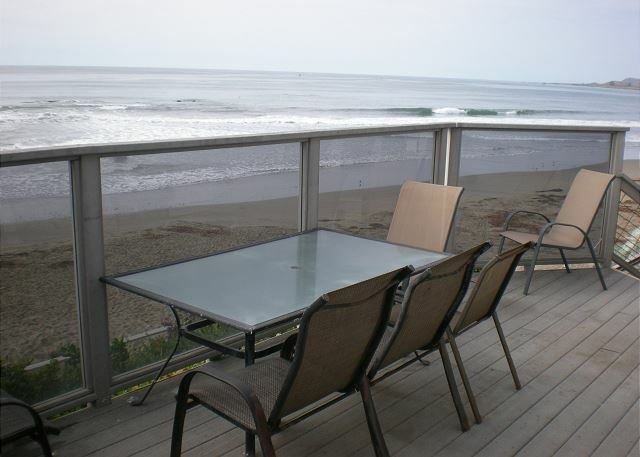 The rear deck is the best and the wall of windows offers a continuious 180 degree view of the beautiful Pacific Ocean, the Cayucos pier and Morro Rock. 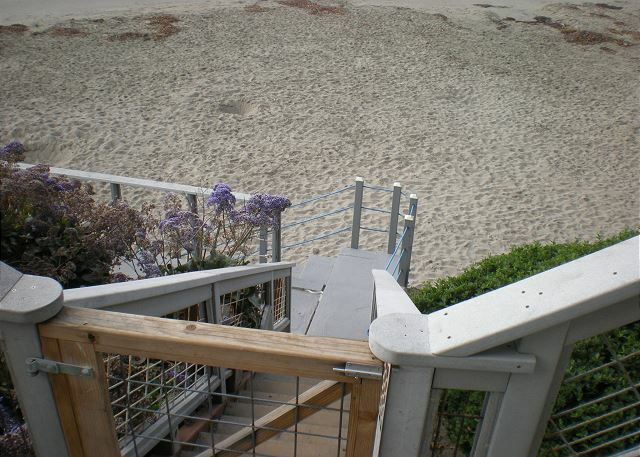 The private stairs to the beach are wonderful for the grand kids to traipse back and forth as needed. Overall, we find this property everything a family could dream. Parking is adequate for 3-4 vehicles. 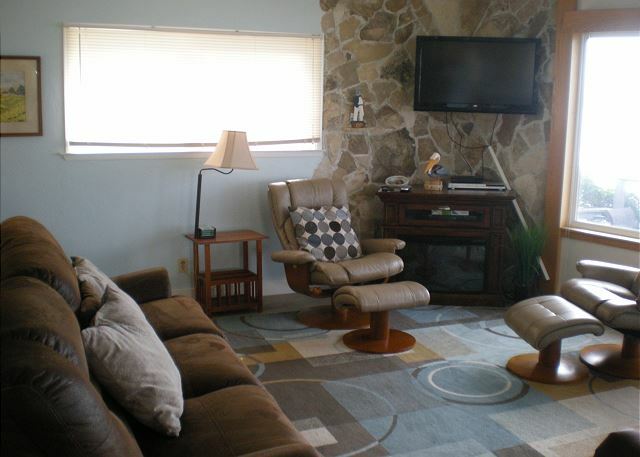 3 Bedrooms and 2 baths meets all our needs for 6 vacationers. Great House and on the beach !! This is such a great house. It is Ocean Front and the views are amazing. The owners of the home are always updating or adding something new to the home. We have been going thru Coastal Escapes for about 10 years now and have rented this home about 15 times. We will be going back in August. Love this house, very comfortable feel to it. Rhonda and Theresa at Coastal Escapes are a pleasure to work with, they are the best !! 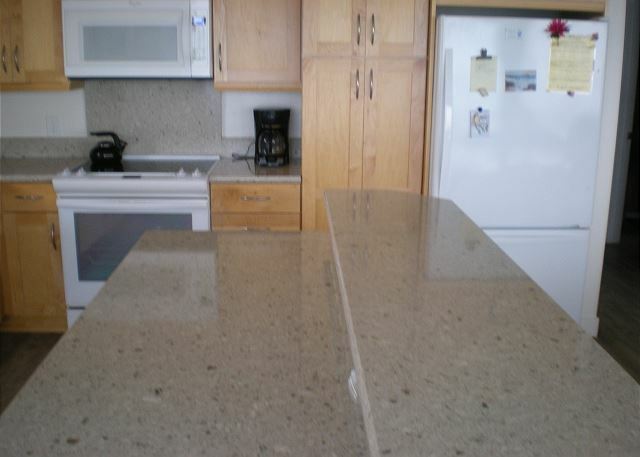 Excellent rental with wonderful ocean view and well equipped house. Even better if master bedroom mattress was replaced. For two couples this was more than enough room. The beds were very comfortable and the bathrooms nicely updated. We knew going in we'd need to bring our own towels and sheets but I was quite surprised that since we needed to wash the dishes that there was no dish soap or dish towels to do dishes by hand. Some in our party thought that at this price a decent TV with cable would be standard. But with that view maybe TV isn't necessary. WIFI was a great convenience and we loved the outside seating area. Overall house was pretty clean, however, it appeared the carpet hadn't been vacuumed for some time. The arm on the couch was broken. But, overall the stay and house were great! 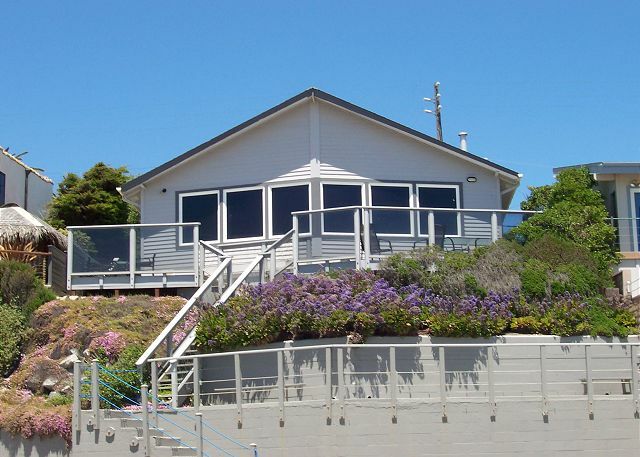 Comfortable, lovely beach home with a great view from the house. We have been staying here for 2 weeks out of the year for several years now, we just love this house. Great home, private steps to the beach, close enough to walk into town. Love dealing with Rhonda and Theresa. Great house--fantastic location. One week just isn't enough time. We had a supper time. The double deck was wonderful for those did not want to go down to the sand. We will be back if if becomes available to us. the view was grand. The glass screens were great at breaking the wind during parts of the day. Bathrooms were wonder. Large living room and kitchen un-abstructed to the rest of the dinning area. Sunsets were fantastic. We have stayed here for years, renting it from 1 to 2 times times a year. will be back in August. 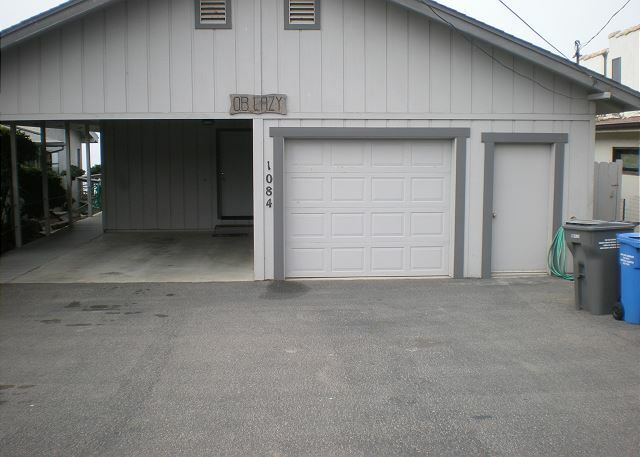 Great home, great location, it is right on the beach. They just added WIFI, very handy. Love dealing with Rhonda and Teresa from Coastal Escapes. The location is perfect & the view outstanding!! Home is showing a little wear. Could use new living furniture & mattress. Also gas fireplace needs replaced. Living room windows always need washing when we arrive. There is way too much clutter in all the cabinets & closets. No room to store luggage & crates needed to bring linens & towels. No remote for tv this time. Housekeeping should have a check list of items to review. Overall, love the home. Rhonda & Theresa are wonderful. Fabulous view, wonderful kitchen, great set up. We have rented several houses from Coastal Escapes and this is by far one of our favorite! This is the second time we have rented the same property and we plan to do it again. We had a wonderful time!!! The house was pretty clean however it appeared the carpet hadn't been vacumed in awhile. Great location and very clean. We've already booked it again for next year. We love the house. They need to replace or repair the dishwasher. We had to wash most of the dishes by hand after they came out of the machine. Thank you. very with our stay.cleanlyness of bay windows only concern. Coming into this house is like coming home. It feels like a home - not a rental. (Pictures of the owner's family on the hall bulletin board make you feel like you know them.) Kitchen is well stocked and CLEAN. Lots of little extras (probably left by former renters) like sheets, jackets, etc. are nice to have if you forgot. Puzzles, games, books in the cabinets. New carpet. Upper and lower patio with fantastic views. I can't say enough good things about this house. We have vacationed at this house for several years and are looking forward to our week there next summer. The house is very well kept and comfortable and the location can't be beat. We love our week in beautiful Cayucos. Overall we consider this week as one of the best vacations we have ever expierenced at Caucos. The weather was great, we have rented this home before and it was better than ever. The accomadations were more than adequate and the views and access to the beach were exceptional. We have this property trserved for 2012 and hoping for a cancelation for the summer of 2011. Great house, great location, oceanfront. Been staying here for years. Coastal Escapes are wondeful people to work with. We have stayed at this property many times over the years. 1 thing would be nice and that is to have he windows washed upon arrival. There is a cleaning fee charged, but apparently it never includes window washing. Also, we were here in Oct. $ reported the gas fireplace was not working. Still not working & we reported again. Repair man out, & may not be repaired. Advertised with a "gas fireplace". Otherwise great house. Love the staff of Coastal Escapes! We had a wonderful time staying at 1084 PAcific. We love the decks and the view from the windows in the living room are gorgeous. It rained that weekend, but that did not dampen our spirits. Thanks for sharing this beautiful home. everything was smooth and easy from start to finish. I have stayed at several beach houses in Cayucos over the years but this house had the best location and parking accomodations. It was very comfortable for the all of us (3 couples). We gave it a thumbs up!! Another perfect week in Cayucos! We have been vacationing in Cayucos for 20 years and look forward to repeating next year and for many future summers. The dishwasher did not get the dishes clean. Otherwise great as usual. The only thing we unhappy with, was the TV. It did not work well and hope it is fixed or replaced by the time we get there again Sept 30th 2009. We have been renting this house for nearly 20 years and the cost is becoming unaffordable, especially in these times. Everything was in wonderful working condition and up to date. My family and I stayed there in May. It was a beautiful house and the staff that I had called was helpful. Looking forward to staying there again next year! Our stay at 1084 Pacific was very enjoyable. The weather was gorgeous and the view of the ocean was breathtaking. We enjoyed the weekend with two other couples and hopefully we will be able to spend another wonderful weekend in Cayucos. Everything was perfect for our celebration of a 60th birthday party. Thanks for a terrific get-away weekend! The location is obviously unbeatable, but what a potential renter can't see is the property is well maintained, the beds are in good (great) condition, the bathrooms are recently remodeled, the kitchen is well supplied (but not cluttered) and organized, and the furniture is comfortable--just a wonderful stay! Our second year at this house, wonderful. very well outfitted kitchen. too bad it wasn't available for us next year, but we found another that we reserved for next year. Another fantastic week at the beach in beautiful Cayucos. The house is clean, comfortable and updated and the view can't be beat. We are already looking forward to our visit next summer! Another Week In Paradise ! Another beautiful and relaxing week with family and friends on the ocean in Morro Bay. Already looking forward to returning next year! It doesn't get much better than this!! Cayucos is a beautiful place and this is our favorite vacation place. The people are friendly and we love the quiet beach atmosphere. The rental people are great! We had a wonderful time at this vacation house. It's clean, comfortable and had everything we needed. The view was amazing! Just a perfect place to stay. WE LOVE COSTAL ESCAPES !!!! The beach house was amazing mostly because of the view. It was refreshing and renewing, God's creation amazing! The house wasn't bad either. Loved the location....gorgeous view and great beach access.